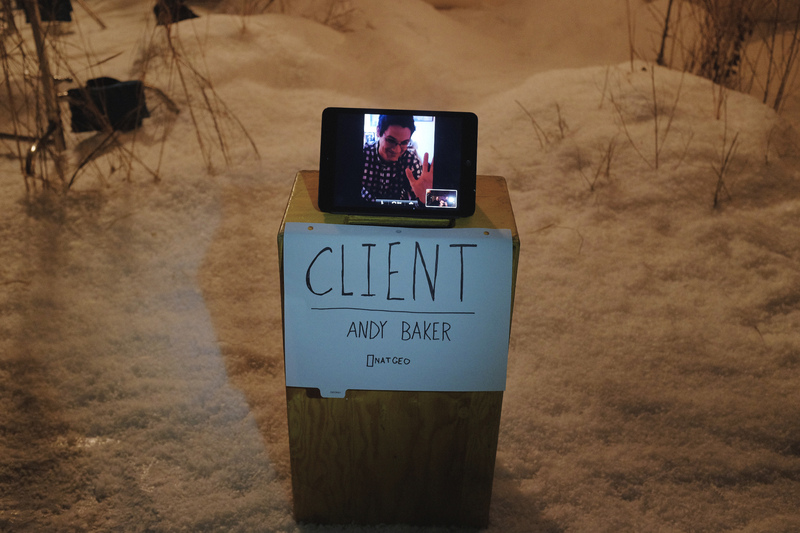 FaceTime On A Photoshoot: Taking The Client Monitor To The Next Level. What happens when there’s no client on set? No client hovering over your shoulder, questioning your every decision or asking tons of questions? Well, when that client really enjoys being on set, and collaborating at every step of the process (that would be me), you can come up with some pretty creative and resourceful solutions. 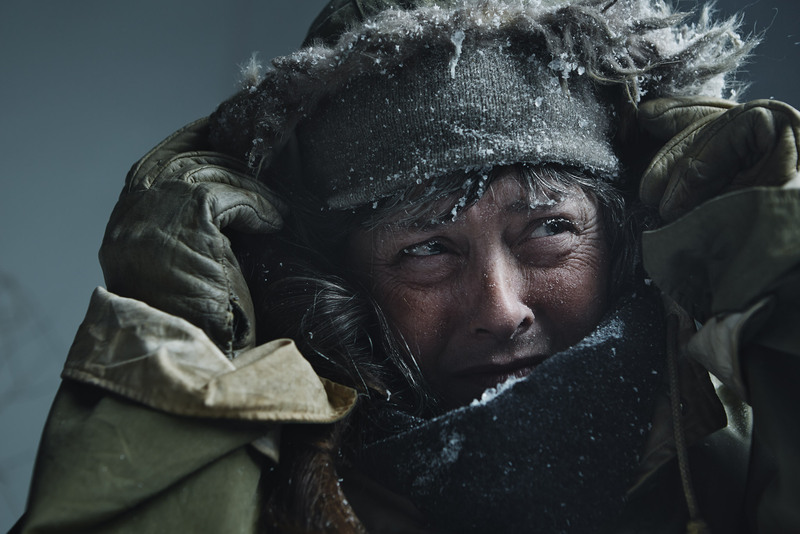 “Life Below Zero” is a show all about the people who live and survive north of the Arctic Circle in Alaska in some of the coldest, most isolated places on earth. They each live hundreds of miles from other people, hunt to survive, are surrounded by danger, and live a life unlike anything most of us could ever imagine. 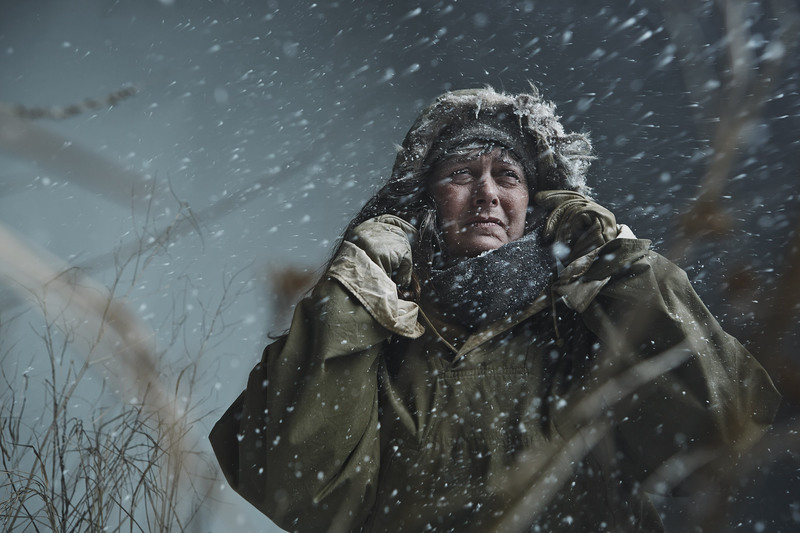 For the new season, we set out to capture the cold, harsh conditions of the place and the struggles the characters face every day. 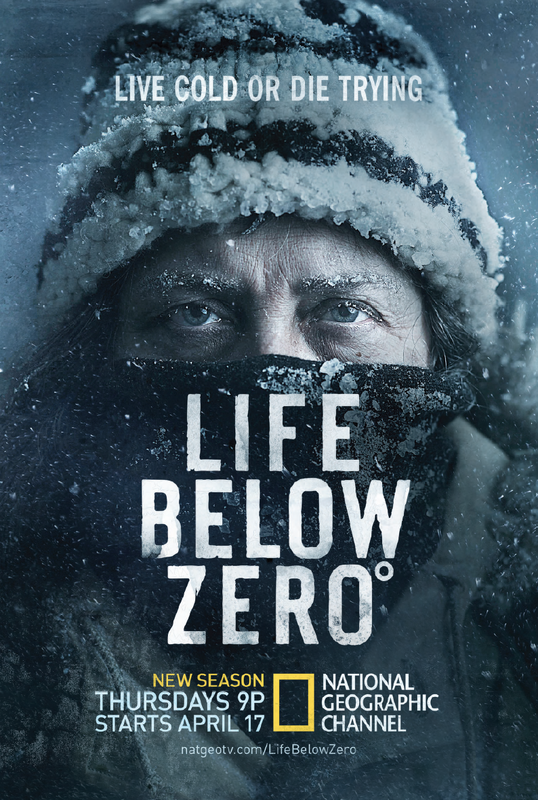 This post will mostly focus on the production behind the print and outdoor campaign for Life Below Zero (LBZ), since there were some unique solutions we came up with to bring the print and out-of-home campaign to life. 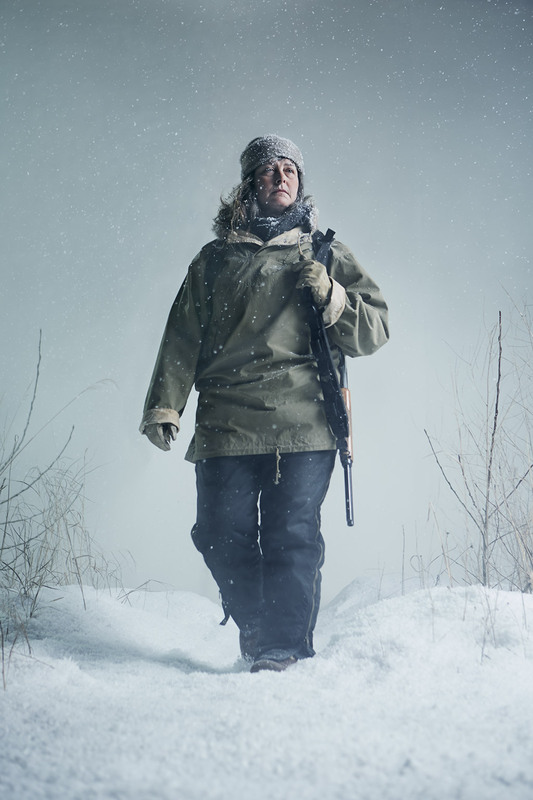 Sue Aikens on set, patrolling the frozen wastelands. 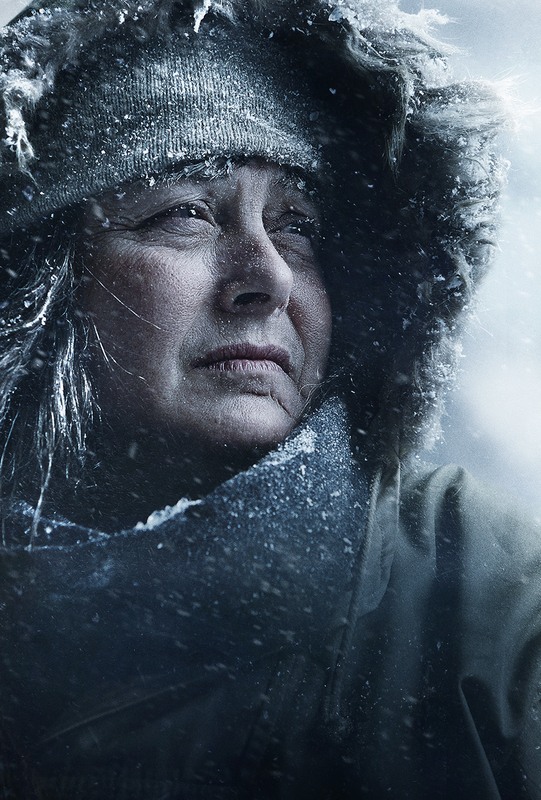 One of the most popular and captivating characters on “Life Below Zero” is Sue Aikens, who lives in Kavik, Alaska – truly in the middle of nowhere – for almost 300 days a year she sees nobody else. We knew we wanted to do a shoot with Sue, but we also knew that getting TO her would be a huge challenge, to say the least. So we wanted to work with a print agency that would be nimble, flexible, and would also come up with a wide variety of options for key art – with and without Sue included, in case we couldn’t pull a still shoot together. The agency we went with, called “Cold Open” (purely a coincidence that “cold” is in their name! ), was one I’d wanted to work with for a while, and we knew they’d be excited to work collaboratively with us. 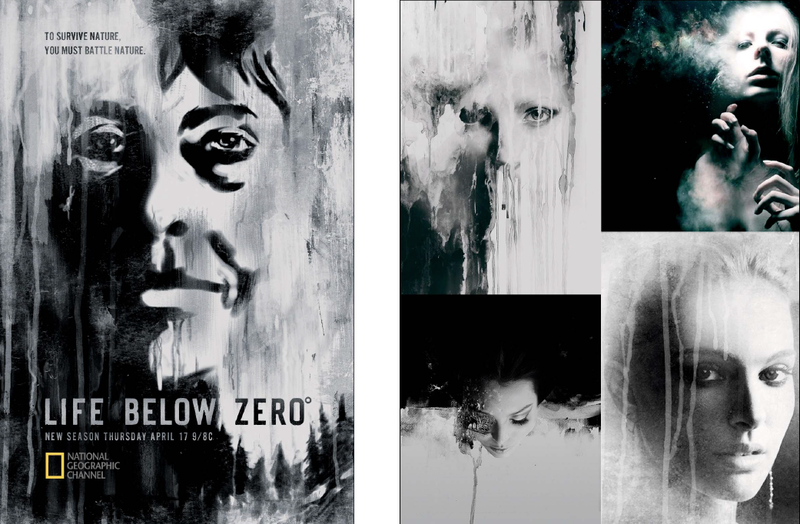 They specialize in key art and posters, and their visual style had a nice bold feel to it – key for a show like this that needed simplicity and a ‘harsh’ feeling to it. They were first tasked to come up with sketches and concepts after we briefed them on the assignment, the show, and the possibility of needing to pull together a shoot quickly. Painterly concept pitch/sketch from Cold Open. Then the project got really interesting as their first round of sketches included some randomly pulled lighting and texture references from some photos taken by Joey L., a collaborator with us on jobs like Killing Kennedy, Killing Lincoln, and Doomsday Castle. By pure coincidence, they had found some great photos Joey had taken for a personal project he had worked on – we mentioned that we knew Joey and loved his work, and the rest, as they say, is history. 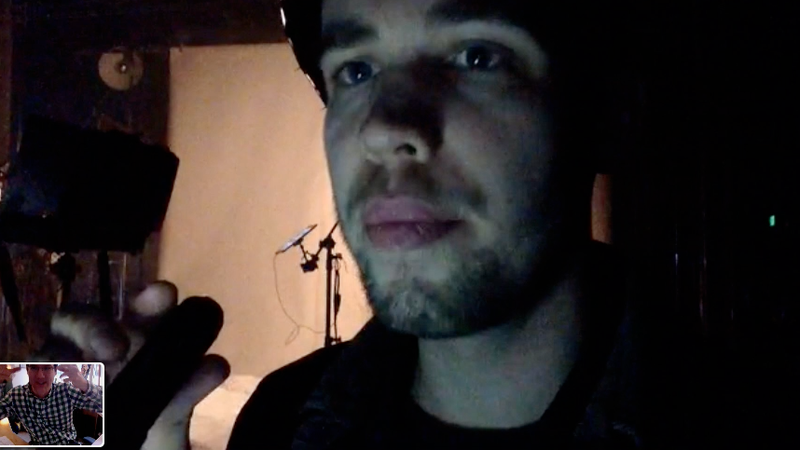 For a detailed breakdown of how Joey got the call, and another example of personal work can lead to paying gigs, read Joey’s post at his blog. Cold Open concept sketch with Joey L. photo reference. Sue Aikens, photo by Joey L.
Cold Open delivered a ton of sketches to us – I always talk about overdelivery, and how I love when I am surprised by a bevy of options we’d never have thought of. It’s why you bring in outside thinking to a new job – to see what they’ll come up with. And there were dozens of sketches, many of them that never changed, some we had to do some tweaking with, and a few we just threw to the side because they didn’t feel right for what we wanted to accomplish. And that’s ok, by the way. I like to see stuff I don’t care for, because it helps further define what you DO like. And just talking through that creative with your production partner can help crystallize the end objectives even more. Painterly exploration and references by Cold Open for a key art concept. My Design Director on this project Carla Daeninckx and I reviewed and dove into the many sketches and came out with a short list of concepts we liked and ones we wanted to refine further. Cold Open made some tweaks, and within a few days we had a very refined list to take to our “clients” internally to review. We picked an image and a look that was a little different than what we’d normally go with – something that was a little more unexpected, and even a bit “artsier” because it was so unique and distinctive. Would it be the final piece of key art? Only time would tell – and no matter what we set out to shoot 3 other concepts as well to ensure we came back from the shoot with many options. We had our final sketches in hand, and Working closely with the show production team from the BBC, we figured out a way to get to Sue to shoot for a day in Alaska. It took a good bit of coordination, and it all had to be done quickly – the show was finishing up a shoot with her and the window was closing on her time, so we had to reach out to secure a photographer quickly, so we called Joey, knowing that he had some experience with cold shooting, and his work had been a reference on the initial sketches. Early text message with Joey discussing the harshness we were looking for. We were lucky that we were able to get on Joey’s schedule on pretty short notice – and his experience traveling to some pretty far-flung places gave us great confidence that a trip to Alaska would be pretty easy for him. We got on the phone as a large group, with Carla, myself, Joey and the team from Cold Open to discuss each concept and hear from everyone about what was resonating creatively, and why. In these sorts of conversations, it’s a pretty free-flowing dialogue but in many cases as the internal creative team we have the luxury of hearing all of the internal dialogue about the show, watch-outs for the campaign, etc. So we felt pretty comfortable about the look we wanted to capture – cold, harsh, and desolate.Sometimes in those conversations, you can’t help but feel like that classic ‘client’ – I even have been known to call attention to that by saying something like “ok, I know this is going to sound client-y, but…” and then say something that at first blush could be misconstrued or just thought to sound stupid. 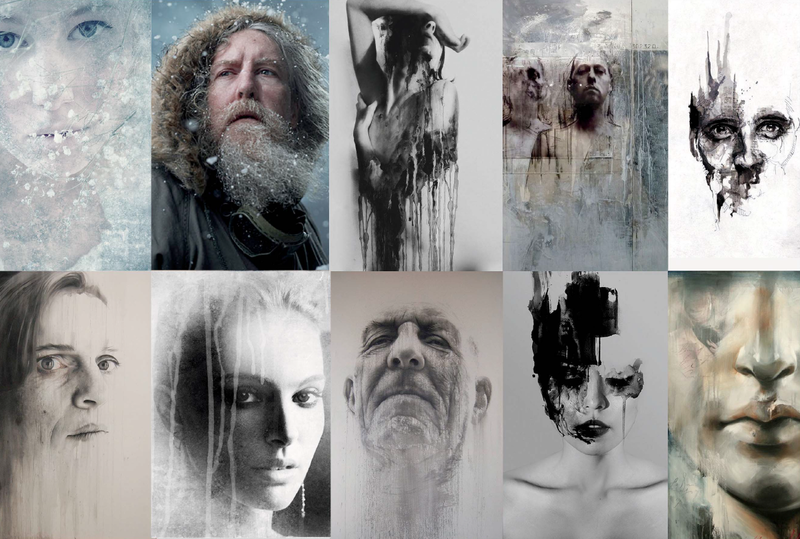 In one of our early calls, I gave my caveat and then said “I want to be careful that we don’t get too snowy – and that we don’t have these big giant snowflakes in the final pictures.” There was a pause and I explained that while we all loved Joey’s portraits that were used as reference swipe, I wanted this art to feel crisper, colder, and less like a snowglobe. (“Snowglobey” became an oft-used adjective after that call) And to me, big fat snowflakes don’t feel as harsh or cold as smaller, more wind-whipped ones do. 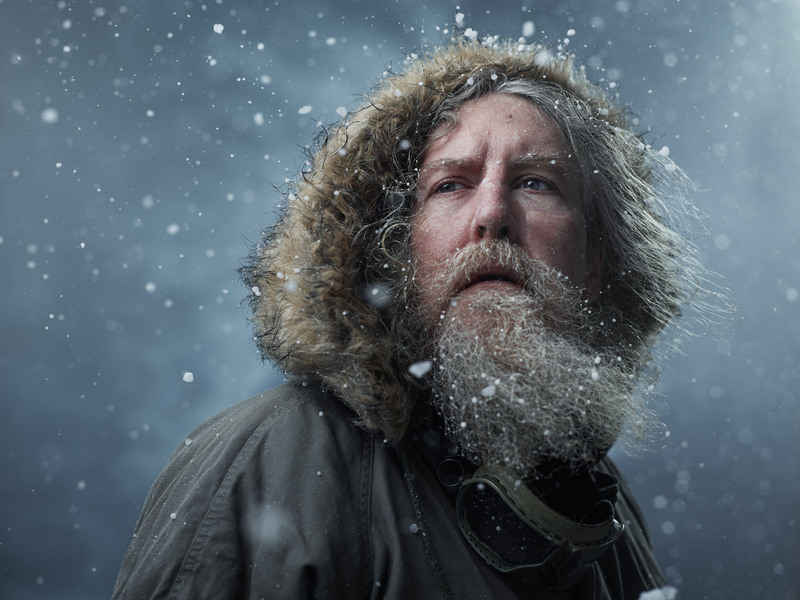 Image shot by Joey L. at “Creative Live” seminar – great reference, a touch too “snow-globey” for LBZ. Someone on the call (I wish I could remember who so I could send them a thank you) actually chimed in and said “Andy’s right – bigger snowflakes generally mean the air is warmer.” I felt a tad less “cleint-y”, and from then on, there were multiple jokes about big snowflakes – but I’m glad I made that comment early, as it stuck with us to remember that we weren’t trying to create a photo that felt beautiful, or wintery. We wanted harsh, icy, and bone-chillingly crisp. A BIG WRINKLE IN THE PLAN. Photo by Joey L. Wince by Sue Aikens. With only a few days before we’d be shooting (we were still briefing and discussing creative a day or so prior to flying out), we came to a point where we had to decide who to send from our team up to the shoot. But the challenge was, the same week of the shoot was also a huge week for us for another project that Carla and I were working on. The creative for that was delivering all week and neither one of us could be out of town or out of the loop for that project’s delivery. 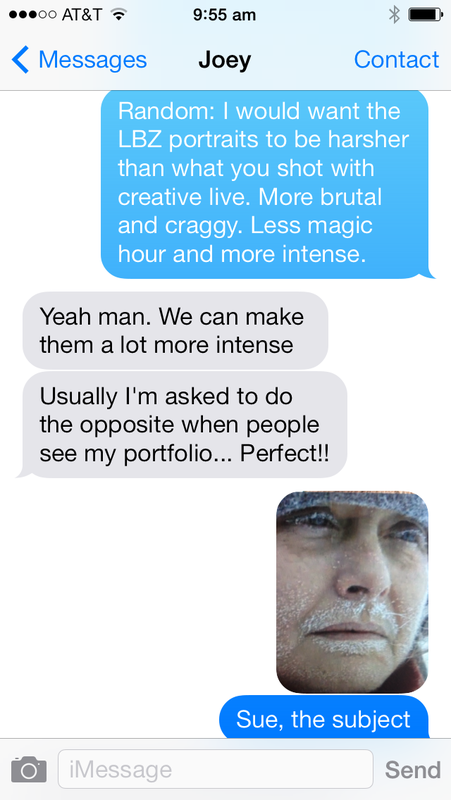 So I had to make the tough decision that neither of us could go – and we were the lead creatives on the job. While a member of our PR/Talent team would be attending to have some Channel representation there, we were bummed that we’d not be able to be on set to collaborate and create with Cold Open and Joey. Truthfully, I wasn’t worried at all from a creative perspective because we had supreme confidence in both parties, but still – there’s no substitute for being there. And here’s where it got really fun – having worked with Joey so many times previously, we have a fantastic creative relationship. Fat snowflakes and snowglobe comments aside, he knows that our collaboration has led to great work in the past and is something we value highly at Nat Geo. So he had the idea – why can’t we attend the shoot, remotely? 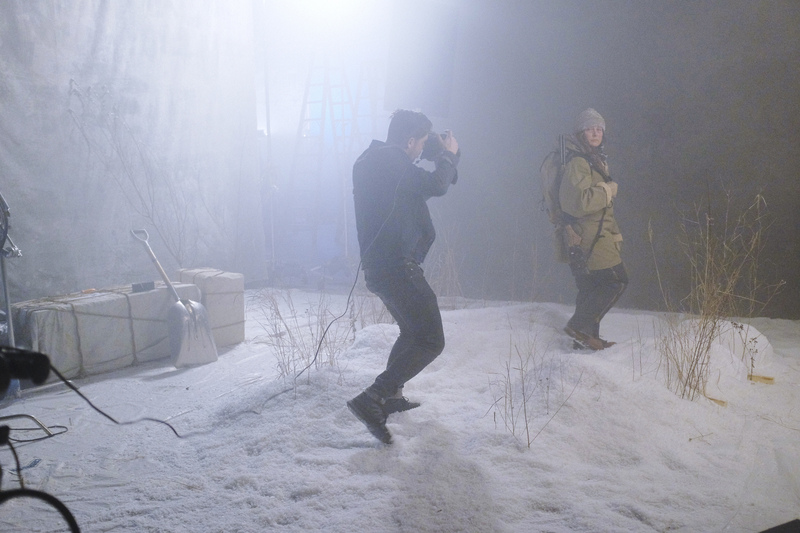 Once he landed in Alaska and had checked on the studio where they were setting up, he was able to hook up his iPad to create a way for us to watch what they were doing and feel comfortable with the setup and look of what they were shooting. We did some Skype tests, then found that doing Apple FaceTIme would work better and with less stuttering and “can you see me? I can’t hear you…are you there? !” conversations that are the hallmark of Skype. We were going to attempt what I had never tried before – to remotely attend a shoot via the power of technology! NOTHING BEATS BEING ON SET, BUT THIS SURE COMES CLOSE. Prior to that shoot, we’d had multiple pre-production calls with Cold Open and Joey, reviewing and re-reviewing our sketches, wardrobe, plan of attack, poses, expressions, everything. Being on the same page creatively was never more important since we couldn’t be there – and even though we planned to facetime the shoot, you never know if that will totally work or not. After a few initial tests, though, we were able to get it to work – and it was incredibly cool. 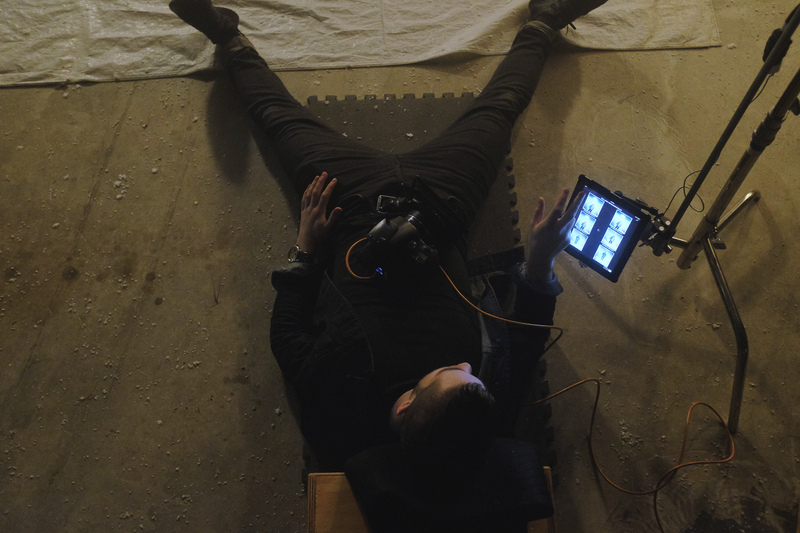 Photo of the “client monitor” on set. Screen grab from facetime session with Joey L. Note my over-the-top hand gestures, and patient expression from Joey. The Facetime ‘client monitor’ was a really great setup. Carla and I were able to check in, “meet” Sue, make wardrobe decisions, and just sort of see progress as they went along during the shoot day. During one of the critical setups, we had some hat-related decisions (with ear flaps? just a hood?) to make and it was very helpful to see options and what they had shot so far. During breaks, Joey would come over to the iPad and scroll through the images he had on Capture One and, if nothing else, it was reassuring to see the great work they were doing as they were getting it. An alternative choice for art – ultimately we didn’t use this because we wanted to see Sue’s face more. Sue on set, stellar art direction by Joe Sciacca. 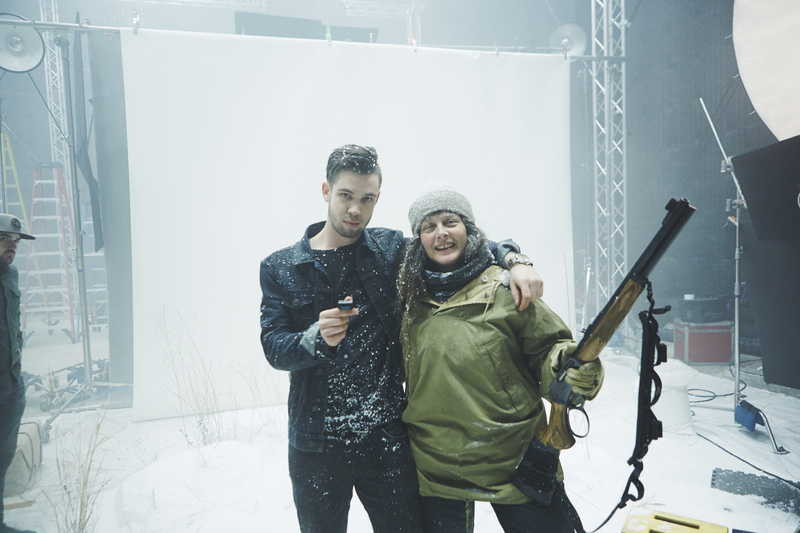 Joey L., Sue, and her trusty rifle take a break on-set. The team in Alaska captured so many incredible shots. They wrapped on a Wednesday, flew home, and by Friday they were starting with building out the key art. Our deadlines were insanely tight – Cold Open basically had a weekend to build out all of the comps and propose options to us – and the option we had initially chosen was more painterly and artistic than a regular photo, which would require extensive retouching and time to get perfect. When they proposed all of the best options in a PDF on Tuesday, we ended up picking one of the more ‘straight’ photos rather than the heavily treated image. Final vertical key art. Photo by Joey L.
Ultimately, the photo of Sue that we picked captured everything we were looking for. Harsh, cold, and badass. Having her looking towards that negative space where the logo and tune-in would sit was great, and this photo captured the spirit of the show perfectly. We debated a few options, but this felt like the winner. And while I would have loved nothing more than to go to Alaska for the shoot, we definitely made the correct decision (the other project delivered on time, in case you were curious) and the end result wasn’t at all affected by us not being there. We got to use technology in a way I’d never done before, and opened up a new possibility for the future should a similar situation arise. 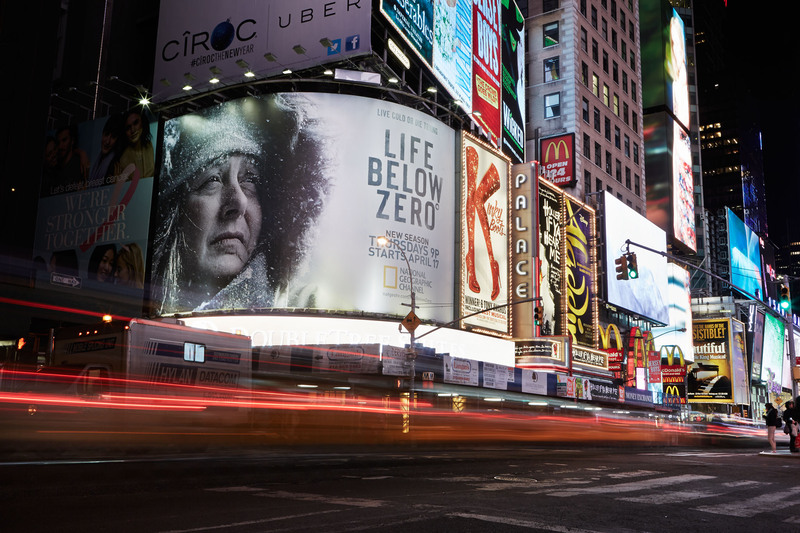 If you’re in NYC or Los Angeles, you can see the artwork all over the place – including a billboard in Times Square (at 47th and Broadway, as seen in the photo below), bus kiosks, and the Helmsley Walkway. In addition to this killer print campaign, we did some TV spots I’m very proud of, which are included at the bottom of this post. Billboard in Times Square. Photo by yep, Joey L.
BUT WAIT…THERE’S MORE! A BTS BONUS. Our campaign of course was more than just cool billboards and still shots – we also had an entire TV campaign to create for our off-air media buy. We hired the talented design team at OneSize in Amsterdam to concept and execute on the graphic look for the TV promos. Since we were early out with the key art sketches, we shared the work from Cold Open as one possible direction to flush out. Our timeline was very aggressive, so we dove right into treatments with producer Pepijn Padberg and creative director Kasper Verweij. On the first presentation,we saw some potential in one of the designs and wanted to steer it in an even more intense direction – inspired by our own recent harsh winter conditions in DC, we asked for a “black ice” look that would deliver on the harsh, crisp vibe of the show. This concept consisted of titles that would build on like ice crystals of freezing water on glass or a lake. 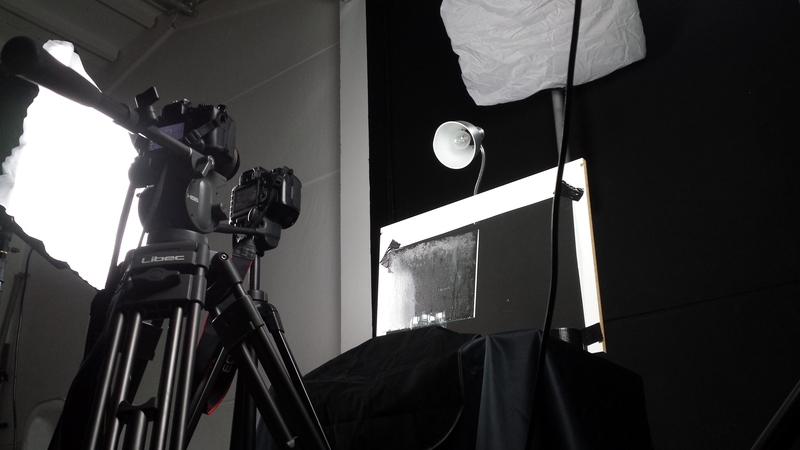 Time lapse setup of ice crystals by One Size. OneSize then went to work on pitching to each other internally within their company to formulate how the graphics would be executed. The only way they knew to get the job done was too replicate and shoot this formation of the crystals for total authenticity. They first researched how ice formed and what types of liquids would yield the best results. Turned out that salt water was the most effective. 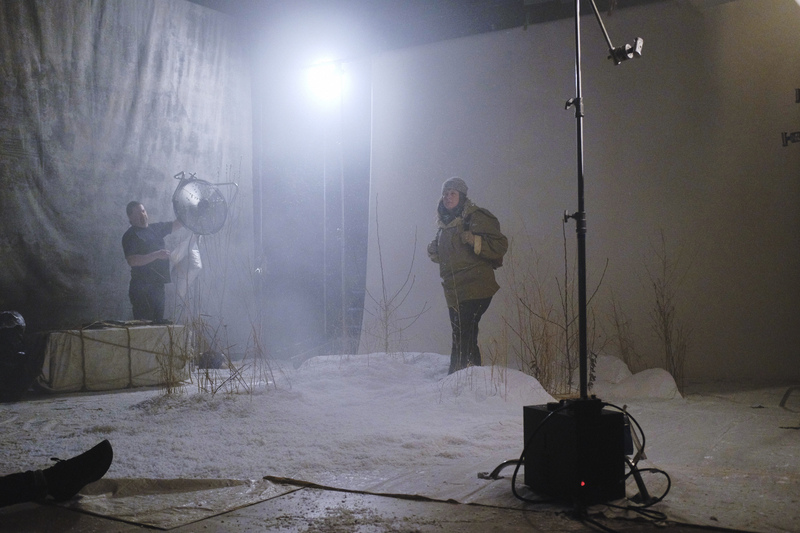 They rented a large freezer and rigged a camera unit inside and captured with time-lapse photography both the ice both forming and melting as backplates that could be manipulated in after effects. These shots were then speed ramped to get the rapid freezing and thawing of the ice crystals. Black ice crystals. 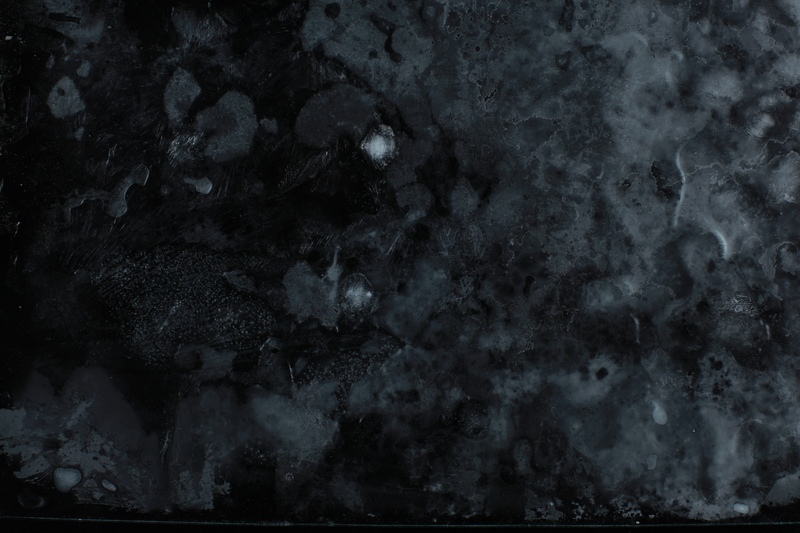 Or, a microscopic slide of a deadly Netherlands-based animation contagion. Partnering with the editorial team at Ultrabland in NYC, the cut was a big driver in the final outcome on pacing and timing. 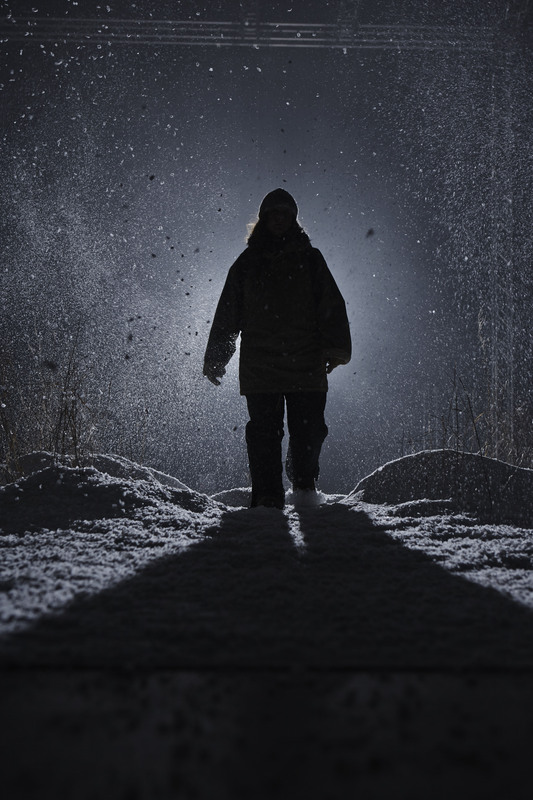 As each word hit on the screen, the black ice would crack and react for a startling get your attention effect. The building of the crystal particles of the text were generated by particular, and an added 3D layer of ice shards help to accentuate each pounding beat. Another big thanks to Carla who helped steer the design ship – proving that no matter where your production partners may be (Alaska, Netherlands), as long as you are working with the right people, it doesn’t matter where you are. 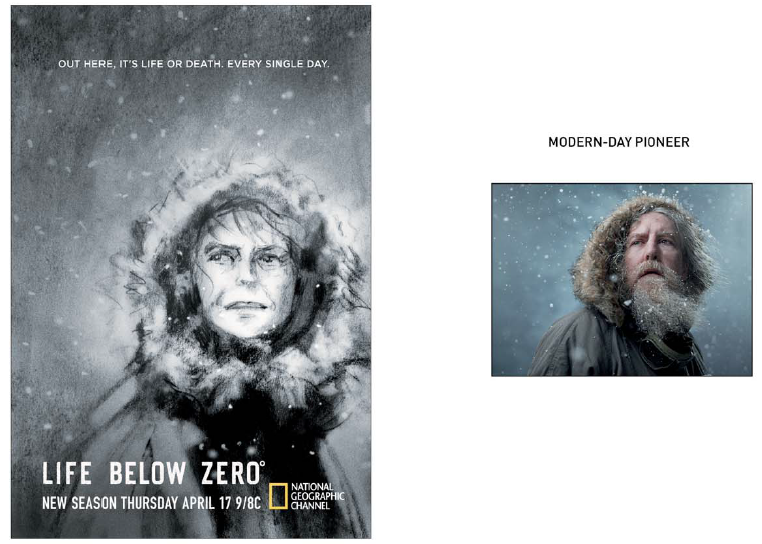 Thanks to the entire team at Cold Open, Joey L., Ultrabland, OneSize and my team at Nat Geo (including Senior Writer/Producer Nicole Strong and Creative Director Tyler Korba) for yet another amazing collaboration and especially for everyone being so inclusive of the client. It was truly a cross-continential collaboration! Thank you for the insightful blog post, I got linked here via Joey’s blog and I have to say it’s very cool concept for your blog, for me as a photographer to see things from the client’s perspective. I will definitely going through all your blog posts. Thanks so much! Glad you enjoyed it. © 2019 The Client Blog.